In 2017, we’ve had the privilege of receiving three awards in a row for our excellence in Interactive Media Production. EI Design’s gold award-winning interactive video framework is capable of integrating YouTube videos and other repositories. Through this, learners experience a learning journey that helps meet specific learning outcomes. Our next winner—the Gamified HR Portal—facilitates an alternative connection between the employees and the HR. This enables employees to understand and enjoy the services and benefits offered to them by the organization. 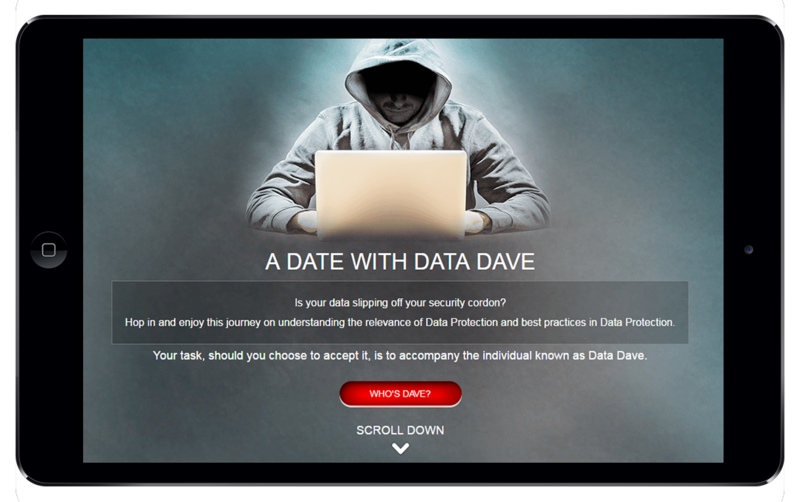 Last but not least, A Date with Data Dave—a microlearning nugget on data security—takes learners on a journey via an interactive parallax-based scrolling format. “Dave” takes learners through offices with varying levels of data security and provides them with the best practices to protect data along the way. Let’s look at them in detail, shall we? EI Design’s interactive video framework has features that render all videos accessible through a visual menu that connects various assets into a learning path. This showcases a learning journey to the learners. The videos are displayed topic-wise to meet specific learning outcomes, and they aggregate to the required terminal learning outcomes (exactly as in traditional eLearning courses). And that’s not all! The best part about this framework is that it allows learners to pause the video at any point in time and have them perform activities (to explore, check-point, or reinforce). They have the liberty to add interactivities by pausing videos at specific cue points and bring in interactions like click to reveal content, questions in various formats, hotspots etc. This framework also allows L&D teams to track learner activity like progress, completion, scores, and so on. How Does the Gamified HR Portal Work? The HR Portal proposes to create a fun, positive employee experience by helping, in particular, new joiners comprehend the work environment in their organization. It suggests a complementary method of connecting with the HR and understanding the many services they are endowed with as organization members. The program comprises five levels that talk about “What you get in the organization.” At each level, learners listen to a short conversation between two penguins regarding a specific aspect of the benefits. After this, they are required to complete a challenge by getting all the correct answers within the time limit. To initiate the game, employees are required to register with their official email, create a profile (upload an image or select an avatar), and have a personal motto that will appear on the Leader Board. This gamified portal is also accessible on computers and mobile devices. “A Date with Data Dave” is a microlearning nugget on the Compliance subject of Data Security. The nugget is in the form of a responsive web-based training format and takes learners through a “scrolling” journey. This training format is called interactive parallax-based scrolling. “Data Dave”, a fictional character, introduces the learner to three offices with varying levels of data security and provides the best practices to protect data along the way.